As we enter the Father’s Day weekend, I wanted to talk about my own father and how he influenced my life and the life of my brothers by taking us to the Indianapolis 500 when we were young. Most of my co-workers know that I use my vacation time during the Month of May and assorted IndyCar race weekends. Many think I spend that time going to NASCAR races, mostly because they don’t know the difference or they don’t really care. But some know a lot about how we spend our vacation time and are intrigued how I chose to follow IndyCar instead of NASCAR, while growing up in the south. The simple answer is…my father. My father was not a sports fan by any stretch of the imagination. When I was growing up, he would occasionally listen to the radio broadcasts of the Tennessee Vols, but would usually turn it off if they started losing. He never cared for any other form of football, nor any form of baseball or basketball. Hockey was never even thought about by anyone in the south back in the sixties, so it wasn’t unusual that he didn’t care for hockey either. He allegedly played golf before I was born, but I never saw him swing a club in my lifetime. I have vague recollections of him going on hunting trips when I was little, but his rifles and shotguns had long been put away before I even started elementary school. But his lack of enthusiasm for sports did not mean he discouraged us from playing sports or being sports fans. In 1971, when it was announced that the New England Patriots and the New York Jets would play a pre-season game in Memphis, my father bought us tickets and took us mainly because he knew what an NFL fan I was. Nowadays, we all scoff at pre-season games. But to a twelve year-old who had never been to a football game bigger than a high school game – this was big stuff for me. I’m sure it was a miserable night for him, but it was one I still remember to this day. His love was cars. He and his identical twin-brother loved all kinds of cars. Growing up in a small town in Tennessee during the depression, they weren’t exposed to fine cars first hand. But my father and uncle were always avid readers and they studied the cars of the day while growing up, through books and periodicals. This love of cars led him to start paying attention to the Indianapolis 500. When this occurred, I’m not sure. When I was five, he announced that he was taking my two older brothers to the 1964 Indianapolis 500. I had no idea what it was, but based on their reactions I knew it was something big and something I was missing out on. His reason for not taking me was that he figured I was way too young. Needless to say, I wasn’t happy. My mother found the race on the radio sometime after the re-start due to the Sachs/MacDonald crash. I would be lying if I said I listened to it intently, but I was semi-aware of what was going on. When my father and brothers returned with the race program and a couple of other race-related magazines and souvenirs – I devoured them. I’m not sure I could even read at that point, but I sure could look at the pictures and ask questions. I was also immediately drawn to the color picture on the back. It was the traditional Firestone ad that featured the photo of the previous year’s winner – in this case, Parnelli Jones driving ‘Ol Calhoun. With that name driving that car, I knew instantly that he was my favorite. With a little bit of lobbying (which is code-speak for massive whining) on my part; my father reluctantly agreed to take me along the following year. My mother was included as well, but I think she would have preferred to stay home and hit herself in the head with a hammer. My first Indianapolis 500 in 1965 is still one of the most unforgettable experiences of my life and I have my father to thank for it (and my mother’s willingness to go along). For the next several years, going to Pole Day and Race Day for the Indianapolis 500 became a family tradition. My mother abstained from Pole Day but attended the race for a few years. The last year she went was 1969 when Mario Andretti won. By 1970, she chose to stay behind and let the men go. Looking back, I don’t think my father was into going to the “500” near as much as we kids were – I just think he knew how much it meant to us, and it was something we could all do together. All good things come to an end. Before the 1973 race, my oldest brother was about to graduate college and my middle brother was already in college. By then, I was pushing fifteen and was in the process of becoming a fairly despicable teenager. For whatever reason, my father decided to give up his tickets and stop going to Indianapolis. I was crushed. I had been going to the Indianapolis 500 for about half of my life and it was about to stop. Twenty years went by before I attended my next Indianapolis 500 in 1992. By this time, I was married and had two young kids of my own. My wife (at the time) and I went and froze that cold day in 1992. She was not near as enamored with it as I was, so she chose to sit it out when I returned the next year. Who did I ask to go with me in her place? My father. He and I drove up together and spent two nights up there. I had a friend who worked for USAC that was able to sneak us into the garage area on Race Morning. My father was an emotional man – far more emotional than I am. In the sixties, he would always tear up when Tony Hulman gave the traditional command to start engines. I will never forget the sight of him that day in 1993 standing in the middle of the garage area, looking out towards the stands. He began to weep as he uttered “…I never thought I would ever actually stand in Gasoline Alley”. Perhaps the Indianapolis 500 did mean more to him than a family outing. After browsing through the garages, we made our way to our seats. We watched what would be a very eventful race and though we didn’t boo, we were both shocked when Emerson Fittipaldi chose to drink orange juice in Victory Lane. The next day we drove back home exhausted, but content knowing we had both had the time of our lives. In early May of 1994, after not feeling well for a couple of months – my father was diagnosed with pancreatic cancer. He had a major issue just days after being diagnosed, so severe that I stayed home from Pole weekend. But he stabilized over the next week and he urged me to go to the race, knowing how much it meant to me. He lasted for seven months and passed away on December 1, 1994 at the age of sixty-eight. I wish I had pictures of that 1993 race weekend…or any weekend growing up going to the Indianapolis 500. One of my father’s quirks was that he rarely, if ever, took photos with family members in them. He was one of those that loved to take countless pictures on a trip and have them made into slides. He would then invite friends over to torture them with slides from our family vacation. The trouble was, there was no family in the family vacation slides. He considered that a needless distraction from his slide presentation. Instead, he would bore his guests with generic pictures of the Grand Canyon or Disney World. I shudder to think what he would do to his friends today, with PowerPoint available to him. Every now and then, one of us may have been captured in a photo but that was usually by accident. To better illustrate this quirk of his about family photos – about ten years after he died, I took on a project to electronically scan any slides he had that had pictures of family members in them. Out of more than six thousand slides, there were only about three-hundred photos of family members. That’s less than 5%. I know, I know – it’s odd, but that’s the way he was. He loved his family. He just didn’t care anything about pictures of them. He would never have allowed me to take a picture of him that day at Indianapolis in 1993. There were no selfies back then, so that day is only alive in my mind with no photographic record of it. It’s the same way for all of the trips to the Indianapolis 500 I made as a kid in the sixties. As far as I know, there is not one single picture of me or any of us at The Speedway in those days. We know we were there, but there are no photos to prove it. 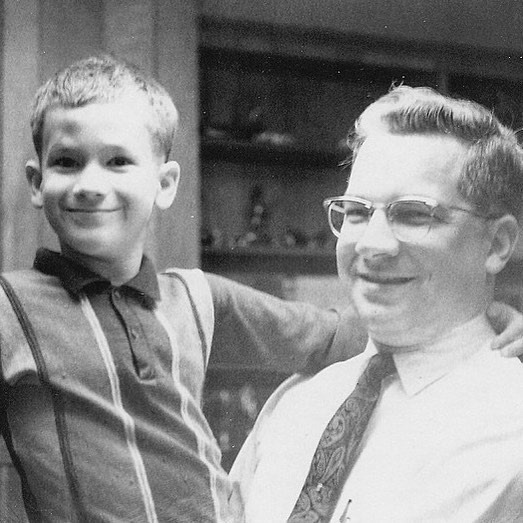 So I’ll show this one photo of me and my father, taken in our home – the same home where my mother lives today – sometime around 1967, right in the heart of when we were going to the “500” every year. But other than being a family-photophobe, he was a wonderful father. He loved cars, travel, taking photos of things (not people) and he loved the Indianapolis 500. Most of all, he loved his family. I sometimes feel almost apologetic when I say I grew up in a Leave it to Beaver household. As I’ve grown older, I’ve learned how rare that is today and I’m grateful to both of my parents for it. He worked, while my mother stayed home to raise three boys. We were all three semi-mischievous, but never got into any real trouble. My parents never divorced, rarely fought and we all mostly got along. When he died, it left a huge void. Although he has been dead for over twenty-three years, I think of him every day. I sometimes wonder what he would think about me having the type of access I now enjoy at Indianapolis. I will confess that many times, including this past May – I will walk right over that spot where he stood in amazement in Gasoline Alley and I’ll think about him. It’s things like that that make the Month of May a little more special. Many of you were drawn to racing by your own fathers. Some of you have been going to the Indianapolis with your own fathers since you were kids and you are now finding yourselves in middle-age, yet you are still going to the Indianapolis 500 with your father. My advice to you is to cherish those moments. 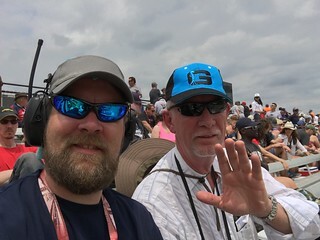 You don’t have to verbalize anything overly dramatic, but next May on Race Day – take a moment to look over there and appreciate the sight of seeing your dad right next to you at the same track you have been going to together your entire life. You never know if that might be the last time it happens. I’m glad my father and I had one last Indianapolis 500 together in 1993. But every May, I always wish that I had one more. To all the dads out there, past and present – Happy Father’s Day! This entry was posted on June 15, 2018 at 4:03 am and is filed under IndyCar. You can follow any responses to this entry through the RSS 2.0 feed. You can leave a response, or trackback from your own site. Great pic George. I would say my dad indirectly was the reason I’m a racing fan. He wasn’t a fan himself but he did take me to the track for the first time in 1957. He didn’t discourage my brother’s and my interest in racing, but he helped us get tic just gets to my first 500 in 1962. Wonderful story George, thank you for sharing. My dad took me to IMS for the first time when I was around 7 or 8, it was a just a practice day and we were just stopping briefly to see his dad who was taking photos for a newspaper. I still vaguely remember standing inside turn 3 and watching loud cars go by. He was not able to attend my first race with me (the first Brickyard 400) but was the one who facilitated my trip there and went to many Brickyards with me after that and also managed to get me a press pass a couple times so I became the third generation to officially shoot a race at IMS for a newspaper. He was not with me at my first 500 20 years ago but is usually there with me every year now. Here we are at the 101st running last year. And happy Father’s Day to all the dad’s out there! One Saturday night, my father took my sister & I to watch him race at a short track somewhere. This would be my first race and probably ( I’m guessing) Dad’s only one. It was a covered grandstand, probably 40 entries …….. and the phenomenal noise, smoke, smells and mayhem were super intoxicating to a young teenager. Although my father and sister could have cared less after that I was hooked on racing for life. Thanks Dad!!! While we both have been motorsport fans for quite some time, it was my son who introduced me to Gasoline Alley. For a 2006 Christmas gift, our son gave me the gift of a trip with him to the 2007 INDY 500………… A cherished memory to be actually standing in Gasoline Alley. When back in the late 1950’s (prior to any television coverage) while listening to the annual live Indianapolis 500 race broadcast over radio station WTIC in Hartford, Connecticut never thinking that I would actually some day attend the INDY 500……………….. I loved this post George. I’m pretty emotional so I shed a few tears while reading. Such sweet memories. I might need to write a similar post about my dad if you don’t mind me using your idea. What a lovely remembrance of your father, George. Thank you for sharing. It is rare that I have attended a race without my father, and it is rare that he has attended a race without me (since I was old enough to go). He was a race fan before I was of age to go, attended Indy in 91 and 93, but not like he is now and never quite as intense as I was/am. His father was a race fan (though probably more of a car fan), as was his grandfather (on his mother’s side, my great grandfather) who briefly raced and later built sprint and midget cars in south Texas in addition to being a track official for several years. My earliest racing memories are watching Derrike Cope win the 1990 Daytona 500 on my grandparent’s television and watching Arie win the 500 that same year… all with my dad. He took me when I first saw Supercross at the Astrodome (1990 or 91), he took me when I first saw monster trucks (Astrodome 1993), when I first saw NHRA drag racing (Baytown 1994), when I first saw sprint cars (Battleground Speedway 1995); he took me to my first NASCAR race (Texas 1997), my first IndyCar race (Houston 1998, Texas 1999), and my first Indianapolis 500 (2011). I have been to hundreds of races with my dad, and I cherish every single one of them. I know he does too. That even goes for the unbearable concrete “grandstands” at the late Gator Motorplex, the unbelievably wet NOLA Indycar race, and the hours-long misery that was trying get within 15 miles of Texas Motor Speedway in 1997. One other thing about my father: for me, there was never a time before “selfies” because of him. My dad stands more than a foot taller than my mother and was, of course, much much taller than me or my sister until we became teenagers. Thus, we have dozens of (what we called) “self portrait” photographs taken with a film camera, my dad holding his long arm out and snapping the shot from a high angle while my mother, sister, and I huddled next to him. “Say cheese!” or “say Texas!” my parents would say to get us to smile. Great post George! I was seven when my father introduced me to the Indy 500 via the radio broadcast (on our old 4-band console radio that was larger than a microwave). I was his little shadow in those days, always tagging along when he’d let me. He was always listening to sports on that radio (to this day I love listening to football games over crackling AM reception just for the memories). When I asked what ‘we’ were listening to, he gave me a long introduction to the 500 and its history and shared that he’d always hoped to see it in person one day (he/we never did/have). But he was faithful to the radio broadcast, no matter where we were or who we were with–a tradition I’ve kept up for 57 years only missing one year in that span. Some years it was difficult when AM stations stopped carrying it, but I always found it on one of the radio frequency bands, and thankfully SiriusXM came along. One of my long cherished Xmas gifts was a 4-band transistor radio that my parents gave me when I was about 10 or so. It finally bit the dust a couple of years ago unfortunately. Every year I couldn’t wait to hear Sid Collins–I thought he was like a god of the airwaves! Each year that I listen to the broadcast, I relish the memory of that initial race broadcast I shared with my father way back then. Here’s to all the father’s out there–enjoy your day Sunday! I love this post George. Thank you so much for sharing your memories of your Dad. My Dad took me to my first Indy500 in 1950. Prior to that he took me to many Saturday night “modified” races at the local Hales Corners 1/4 mile dirt track where Duane Sweeney was the flagman. Duane went on to become flagman at many USAC races and was the flagman for at least one Indy500. Dad and I also went to all the races at our beloved Milwaukee Mile to see the “big cars” (the days of Ted Horn and Rex Mays) After Dad died I would get the same seats that Dad liked-the north end of the upper grandstand under the roof. There were also some good stock car races there then featuring Norm Nelson, Don White, and Marshall Teague in his Hudson Hornet. I took my daughter to the 1992 Indy500 and as you have noted, it was so damn cold that day that she has never asked to go back. If you do not take offense to this, in the photo here of you and your Dad, you look like a little troublemaker. When I posted my original comments, they disappeared. Perhaps because I said that George looks like a troublemaker in the photo here with his Dad. So now I will simply say Happy Fathers Day to George and to the rest of y’all. Sometimes less is more. George’s Dad must have been a top man. He’s wearing a paisley tie in 1967! Wins in my book, anyway. George, this post brought back a lot of memories for me. My story and yours, overlap and have a lot of parallels. My Dad (who was also a twin) introduced me to the Indianapolis 500 when we listened to the radio broadcast of the 1959 race. We listened as we sat on his bed with the pages of the Indianapolis News or Star with printed grids on which to note the position of each car at 10 lap intervals, spread out on the bed. We filled them in each time Sid Collins and his crew provided the run down. We did that each year through 1962. In 1963, Dad took me to the race after he was given two tickets across from the pits by one of my uncles who was the GM of then WFBM, Channel 6, in Indianapolis. I still have the square photos I took that day with my Kodak Brownie Starmite camera. Dad had gone to several races in the 40s and really wanted Mom to go to a race with him, and in 1964, she agreed to go, so I had to stay home and listen to the radio broadcast again. Just before they left for the race, Mom said I could ride with them and sit in the car and listen to the race. I declined. Their seats were on the outside of the track, just past the exit of Turn 4. The Sachs/McDonald crash happened right in front of them. Mom left her seat, went back to the car and waited for Dad until he got back to the car after the race. When they got home Mom said the pre-race ceremonies and the start of the race were the most thrilling experience she could remember. She never went back and we were not allowed to mention the race or the Speedway in her presence again for many years. In 1965 Dad and I were back at the race again, this time sitting in the stands outside the North Short Chute. I remember Bobby Unser going by each lap in a Novi, with such a regular lap time that you could set a watch to his time – until the Novi broke. By 1966 Dad could no longer deny my younger sister’s demands that she should be able to go to the race, so I again listened on the radio as she went with Dad. In 1967 I was a participant in the 500 Festival Parade and the pre-race Parade of the Bands as part of the Lafayette, IN Jefferson High School marching Broncho band. I chose to use Dad’s second ticket to watch the race from J Stand. I still vividly remember following the field as they raced off to Turn 1 on the first lap and seeing, through the dust and distortion from the disturbed air, that Day glow Red turbine car swing wide entering Turn 1 and wondering if I would ever see it again. We could see the end of the back stretch and beginning of Turn 3 from our seats, so I turned my eyes over there to see who was leading. The first car I saw was the turbine which was out of site in turn 3 before I saw Mario Andretti’s pole-winning car approach the turn. I was a spectator at the 500 through 1971, and went with Dad to qualification for the first time in 1969, and saw the aborted qualification run by Jigger Sirois from seats at the fence outside Turn 1. In 1972 I was a credentialed sports writer for the Indiana Daily Student, and began a run of covering every 500 through the 1995 race. In 1975 I became a photo stringer for the Associated Press. After ignoring the races of the end of the 90, which I still don’t count as true Indianapolis 500 races, I was back as a photo stringer for AP for the 2001-3 races. A few years later I worked on the Safety Patrol for three consecutive years. I went to several later races with my brother. Dad was a minister, so when the race was moved to Sunday after the move of Memorial Day from the May 30 date, Dad was never free to go the the race again. My son was born on May 24, 1977, the Tuesday between the final weekend of qualifying and the race (great timing Darian). The next year he was at the track with his Mom for many days during the month and he was at the race for may years after, including the years the race was run on his birthday and won by a different Unser each year. He later joined me for a race or two as a photo stringer for AP, as did my brother one year. Dad died of cancer on April 26, 12 years ago so we decided to go the the 500 as a family (minus Mom, who still refused to go) to commemorate his introducing all of us the the race. The day before the race we buried his ashes. My sister’s daughter brought a box of Origami paper canes to leave behind with him. After we had placed his box in the ground, she was about to turn the box over to drop the cranes on it, but I suggested that we each sprinkle a handful and we agreed. The last two to fall onto his box landed side by side, dead center, and were folded from black and white checkered paper. We all agreed that was not just a coincidence. The next day were were in the much newer stands that had replaced the ones from which Dad and I had watched the 1965 race. I think of Dad often, especially on Race Day. Thanks so much for sharing your memories of your father. My dad loved cars, but racing wasn’t something we did. Ascot was so close to where I grew up and I am sorry we did not attend when I was young. We could hear whatever was racing from home, but never went. My first live race was Fontana in 2012 and I as I sat in the grandstands I was sorry my dad hadn’t lived to be there with me. George this post just made a grown man cry, and that’s not a bad thing. Great post!